After last week's video regarding my dysfunctional microwave, a friend suggested I have people send in photos of their own hideous microwaves, and the more I thought about it, the more I found the idea very appealing. So, as such, I am holding my first giveaway on this here blog. All you have to do is send in a picture of your microwave and whoever has the ugliest or most monstrous or just all around weirdest microwave (as judged by myself and my husband) will win a $10 gift card to Starbucks. The prize is modest, as I do not as of yet have any sponsors on this here blog, but hey! $10 will buy you a couple of lattes, right? 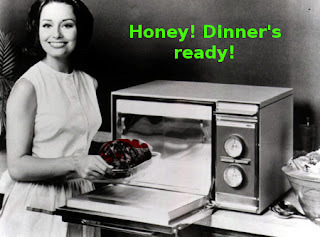 You'll still have a really awful microwave, but if it's any consolation, so will I. So tell your mama, tell your friends, tell anyone you know who has a nasty, no-good microwave to send a photo to me at zeromusings@yahoo.com. The winner will be announced next Friday, Oct. 1, and photos of the winner's and runners-up's microwaves will be posted. I like our microwave, but I'm sure I'd win the hideous kitchen contest. I got that one in the BAG. Shell - maybe that should be the next contest. My kitchen is pretty ugly, though. Oh! But I just cleaned mine! I didn't know I'd need before pictures. Sad!